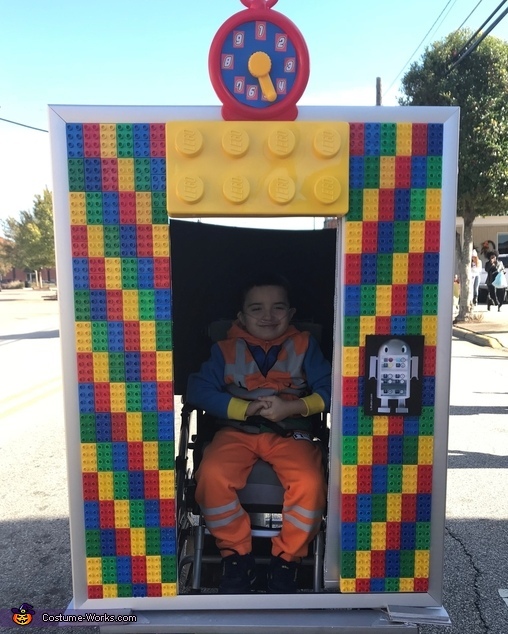 My son went as Emmet the builder from the Lego Movie! He LOVES Legos and he LOVES elevators! He is 7 years old and uses a wheelchair so I always like to build his costumes around his chair. He loves it so much! I got the idea from his interests. He watches youtube videos about Legos and also loves elevators. So I took the two and voila the Lego Elevator was built! He had a lot of fun opening and closing the doors. I used a lot of materials to build it. Legos,base plates,posterboard, 2x4's, gorilla glue,duct tape and velcro. It took about a month to make it and worked on it every weekend from morning to night. It was great to see his face when he saw it.I'm so happy he liked it.